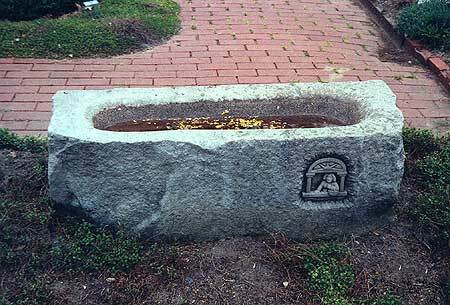 The sculpture is a water trough or basin designed in the style made by Amisl Farmers. The trough has carved figures in windows on the front and back. The carving is in deep relief. Ithas a basin 5"" deep. Location: Toledo Botanical Garden's Herb Garden, 5403 Elmer Dr.
: “Garden Trough,” Ohio Outdoor Sculpture Inventory, accessed April 22, 2019, http://oosi.sculpturecenter.org/items/show/1077.